Ajax wants a foothold in the U.S.
Evert Elzinga/AFP/Getty Images Ajax has helped set the standard for playing attractive, attacking 4-3-3 football. Now it's looking to expand its influence in North America. Relaxing on a terrace a block from the White House in Washington, D.C., sipping a glass of white wine on a balmy Saturday night this past May, Frank de Boer was happy. Now 41, the one-time Ajax, Barcelona and Netherlands defender with the laser-guided long ball looked much the same as in his playing days -- the piercing blue eyes, the short blond hair that threatened to recede but never did. These days, he's the head coach of Ajax, the club that took in him and his twin brother, Ronald, when they were just 14. De Boer had just masterminded Ajax's first Dutch league title in seven years, its longest drought since 1947-57, overcoming a raging power struggle for club leadership, the sale of his best player (Luis Suarez), locker-room unrest and a double-digit point deficit since taking over this past December. De Boer had brought his team to the U.S. to play a pair of postseason friendlies against D.C. United and the Portland Timbers between lots of shopping trips and nights out. That morning on United's practice field, de Boer had overseen a light workout that he labeled "the worst ever." Still, the speed and precision with which the Ajax players carried out a quick succession of one-touch 5-on-5 drills had been dizzying. A day later, his charges would beat United 2-1, simply tapping their way out of trouble with quick combinations, coasting on their superior technique and movement, and playing on a seemingly much bigger field than D.C. did. What Ajax put on display that day could foreshadow a common sight in North American soccer -- homegrown players raised according to Ajax's strict methods in its world-famous academy. But then it would be the American sides putting the famed 4-3-3 system on display, rather than a visiting club from abroad. Call it a pipe dream if you will, but there are several forces combining independently that could see American youth soccer implement the Ajax way. A natural interest in the Ajax model has awakened in the U.S. "In the youth systems the Ajax influence is quite significant," said youth coach Dave van den Bergh, who played two games for the Dutch national team and 3½ seasons in Major League Soccer after graduating from the Ajax academy. More and more youth coaches and leagues lean on the Ajax methods for raising their players, to teach them that all-important technique a lot of American players have traditionally lacked. "With the practices I've seen, you see that a lot of people try to emulate the Ajax methods," van den Bergh said. "They've read the book, seen the DVDs and try to do the same thing." In Amsterdam, we take players in under the age of 10, and if they're very good they make it to the first team when they're 17 or 18. If you can do that in Amsterdam, you could do it elsewhere, too. The book van den Bergh spoke of is the new U.S. Soccer Coaching Curriculum. Developed by U.S. Youth Soccer technical director Claudio Reyna, who traveled to Amsterdam to observe the Ajax academy several times while researching it, this 123-page document is intended as a roadmap for developing the American player of the future. In it, you'll find recommendations of playing offensive-minded 4-3-3 soccer with wide attacking wingers, advancing wing backs and a playmaker behind the lone striker, as well as a focus on technique, routine and repetition to help students learn the importance of spatial awareness and pressing -- all staples of the Ajax system. There's also the project embarked upon by the once-rudderless Toronto FC franchise in MLS, which appointed former Ajax, Holland and Inter Milan star Aron Winter as its head coach and technical director before the start of this season. "We determined that we wanted to have an aggressive style of play that was similar to Ajax's," explained TFC president Tom Anselmi. "The other part is that we believe we need to invest heavily in player development because the game is changing in America. We're investing $20 million in a training facility and so we needed expertise on how to implement the academy system, and where better to look than at Ajax? What we liked about Aron is that as a player and a coach, he grew up in the development system at Ajax." "Ajax has one of the best youth academies, and they [Toronto FC] want to replicate that identity and playing style," said Winter, who had spent the past few years coaching in the Ajax academy. "That's how they want to set themselves apart from the other MLS clubs. I thought it was a nice challenge to implement the Ajax model here." Toronto already has U-19 and U-17 teams up and running, and will add U-15s and U-13s next year and U-11s the following year. All will be run in accordance with Ajax methods. Ajax itself hopes to get in on the action, too. In the near future, the club will seek out an MLS team to open a joint youth academy. This would fold into a larger strategy Ajax plans to implement in the coming years, which will see the club try to monetize its good name in youth development. For all its fame, Ajax trails clubs from much richer European leagues in earning potential. While English, Spanish and Italian clubs can trade on their names worldwide to clean up in broadcasting and merchandising, Ajax has only its reputation. The club was the seventh-most successful European club of the 20th century, winning four European championships and producing generation after generation of superstars such as Johan Cruyff, Marco van Basten, Frank Rijkaard, Clarence Seedorf, Patrick Kluivert and, more recently, Wesley Sneijder and Rafael van der Vaart. But although the Ajax academy has consistently supplied the world's best clubs and the Dutch national team with some of their best talent, these days the senior team's games and jerseys aren't interesting to anybody outside of the Netherlands. Thus Ajax can't afford to hold onto the wealth of talent it produces anymore. So Ajax has had to come up with a different approach to competing for the public's mind share, one that involves U.S. soccer. "We want to see if we can be present on every continent in the form of an academy," explained Marcus Keane, Ajax's American-born director of business development, over a pint of (what else?) Amstel Light. This is Ajax's way of establishing a foothold in the American market, which it sees as valuable now that MLS has steadily grown. But Keane said Ajax can't afford to buy an MLS franchise, like Barcelona has considered. Instead, "we want to do it through our academy system, that's our ace in the hole, that's what Ajax is good at," Keane said. "That's what could help a big club in the U.S. with something there's a lack of in the U.S. -- structure and quality of youth development." The idea is that Ajax will seek out clubs around the world that are willing to outsource their youth player development through a series of joint academies. The hook: These academies would be run according to Ajax's ideals. They would be "authentic and permanent," Keane said. Jasper Ruhe/EuroFootball/Getty Images Frank de Boer celebrates winning the Dutch league after Ajax defeated FC Twente in May. "In Amsterdam, we take players in under the age of 10, and if they're very good they make it to the first team when they're 17 or 18," Keane said. "If you can do that in Amsterdam, you could do it elsewhere, too." But the idea behind the academy-on-every-continent concept isn't to feed players from around the world into the Ajax squad. For its trouble, Keane said the club would ask for recognition -- for starters, in the form of sticking the Ajax name on the club's academy and its teams. "It's more about building something and establishing and solidifying your brand," Keane said. By being present around the world, Ajax hopes to organically grow affinity for its senior team. "In the long run, if you solidify your brand, that will be good for Ajax in all sorts of ways," Keane said. "This is branding, but with substance." Consequently, Ajax figures, its jersey sales, sponsorship and the value of its broadcasting rights will benefit in the long run. Because the project is in the concept stage, Keane won't name names as far as which MLS team might become its partner -- the club says several have declared an interest -- or what countries it plans to move into other than Greece. But one candidate is likely to be D.C. United, whose academy already ranks among the best in the U.S., having produced big prospects such as goalkeeper Bill Hamid and midfielder Andy Najar. "We're great admirers of the way they've built their teams over the years and the philosophy that they have and the commitment that they have to developing young players," said United president Kevin Payne. "It's something we're going to explore a little further to see if there are ways for us to work together. We think there's an awful lot we can learn from them." United has recently hired longtime Ajax player and youth coach Sonny Silooy as an assistant coach who will have a hand in the academy, too. So what exactly is the Ajax philosophy? "It's to play dominant soccer with good positional interplay which creates scoring chances," de Boer explained. It means winning, and winning the right way , which is to play a controlling, fluid 4-3-3 grandson of Ajax's revolutionary Total Football of the '70s, a system premised on the movement and interchangeability of all 10 outfield players. It means a mind-over-matter-like control of the ball. It means keeping the field wide and long in possession and collapsing into the opponents' space after losing the ball. Ned Dishman/Getty Images When Ajax faced D.C. United in a friendly this spring, the Dutch masters won 2-1. And it means playing with homegrown talent, schooled in the Ajax way at the club's venerable academy. There, hopefuls are scientifically and obsessively groomed, their soccer instruments forever calibrated and sharpened in a super-serious and heartless environment. Only the very best are allowed to stick around each year. "If they can find a better player than you in a 100-kilometer radius, you're gone," van den Bergh said. And they will try. A vast network of scouts scours every nook and cranny of Dutch youth soccer, trolling for prospects as young as 5. From the age of 7, the next wave of talent runs through the same drills ad nauseam, practicing the same things the first team does, at virtually the same intensity and speed. "Technique," said Ajax's 20-year-old left back Vurnon Anita, when asked what the focus was in the academy he joined when he was 10. "Always the technique with the ball. And trapping, passing into a teammate, getting open, pivoting into space, playing one-touch passes. That's really what you learn in the youth teams." "It's about positioning, and forming the foundation, the technique, to give you 100 percent control of the ball," said Jan Vertonghen, a 24-year old left-footed central defender who, as a player, bears a striking resemblance to de Boer. "That's what gives us an advantage over our opponents -- that we can often escape difficult situations thanks to the basic skills that we were schooled in at Ajax." If they can find a better player than you in a 100-kilometer radius, you're gone. Compared to the way things are done in the U.S., the Ajax method is "very structured and about routine and building simple things into more complex things," said former U.S. national team stalwart and Ajax academy graduate John O'Brien, who is developing an online Ajax training manual. "There were a lot of technical drills, a lot of passing, a lot of one-touch controlling of the ball -- there was so much of that," he said. "Everything was about form and shape and covering your man the right way." De Boer, who was groomed for the managerial job by coaching the club's U-13s and U-18s first, plays not only a 4-3-3, but also fielded nine homegrown players in the championship game and brought on two more. Against D.C. United, 10 of the 16 who played were homegrown, a lower ratio than usual. "It says in my contract that we always have to play 4-3-3," de Boer said. It also mandates that at least 70 percent of the senior squad is made up of academy products. Ajax has disposed of a great many perfectly good managers who stood in the way of the academy's production line pushing into the first team. Or who had the temerity to deploy fewer than three attackers or more than four defenders. One, Co Adriaanse, was fired while he was in first place. Harsh, yes, but that uncompromising bent has made Ajax an archetype. "And rightly so," de Boer said. "If you look at the Dutch players who have reached the top, I think about 90 percent of them were developed by Ajax. That's, I think, a sign to a lot of clubs that we're doing something right." And that track record is what makes the Ajax way such an attractive model for North American youth soccer. Getty Images/Getty Images Christian Eriksen is one of Ajax's most promising players. Although the Ajax philosophy is perhaps most famous for inspiring Barcelona -- Total Football pioneers Rinus Michels, a coach, and Cruyff, then the on-field foreman, both had long spells as head coach of the Catalan side -- it has touched American soccer, too. In 1979, Michels and Cruyff were reunited with the Los Angeles Aztecs of the old National American Soccer League. There, Michels recreated his Total Football system. When Cruyff left for the Washington Diplomats the next season, he mentored the young Americans in the squad and badgered English head coach Gordon Bradley about abandoning his rudimentary and quintessentially British kick-and-rush tactics and adopting Total Football. When Bradley failed to accede to the legendarily know-it-all Cruyff, the floppy-haired forward got into the habit of wiping Bradley's tactics off the locker room blackboard once the coach had left the room and re-instructing his teammates on how they would really be playing that day, according to Dutch-American soccer coach Thomas Rongen, a teammate of Cruyff's at the time. The next time Ajax washed up on American shores in any meaningful way was when it opened its Ajax Orlando affiliate -- later renamed Ajax America. Starting in 2004, the club fielded a team in the amateur Player Development League. "We had the Ajax kit and all that stuff," said New York Red Bulls midfielder Dax McCarty, one of two alumni, along with Toronto FC midfielder Nathan Sturgis, to have become Major League Soccer mainstays. "We played the same formation. The coaches tried to institute the same principles and patterns of play as they use over there [in Amsterdam]." 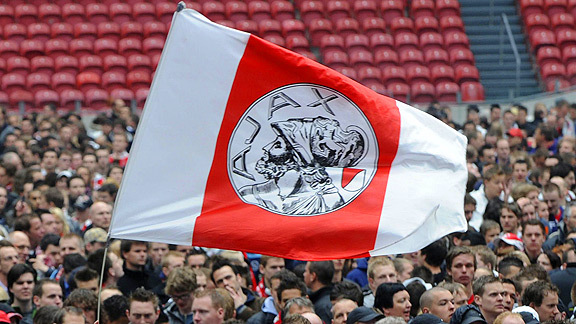 In 2007, Ajax pulled the plug on the project because all resources were needed for the struggling mother club. After both brief spells of influence, Ajax's heritage in the U.S. was lost. This time, though, it could stick. Because the proactive North American manifest-destiny spirit is a good fit for the Ajax model, argue some. "Americans can really relate to Ajax's philosophy of playing, which is to score as often as possible, which is 'Let's outgun the opponent'," said former U.S. U-20 national team head coach Rongen, who was brought to the U.S. as a player by Michels himself. "It's American -- it's aggressive, wanting to score." "Every country has a certain philosophy and culture that seems to steer towards a style of play," Toronto FC's Anselmi said. "Canadians are very much doers and aggressive and don't wait for things to happen and that's what the Dutch style of play is. It made the most sense for Canadians." However, whether the Ajax model will actually work in North America remains to be seen. U.S. and Canadian soccer were largely inspired by the physicality and straight-to-goal tactics of the English leagues -- courtesy of their having been manned by mostly British players in formative years. Superimposing on that tradition a system that lives and dies by its finesse and intellectual outmaneuvering is no simple task. "Americans are a very rare breed because we do produce tremendous athletes in this country," said Ajax Orlando graduate McCarty. "Where we lack is producing players with that type of athleticism who have the technique of a Sneijder or van der Vaart, which is extraordinary. [At Ajax] there's a tremendous focus on making sure that the technical side of your game is very refined rather than being the fastest or strongest on the field. They have a mixture of good athletes who are very good soccer players and very good athletes who aren't as good soccer players. We're still trying to find that mixture in this country." And locating exactly that precious mixture isn't as simple as forcing a fresh ideology on a vast grassroots game. It will take time, and investment. And more time, and more investment. If all goes well, Ajax could prove a key ingredient in the recipe for American soccer success. Or the North American game could search for an adoptable identity for a while longer.